The historic Rosecliff is one of Newport, Rhode Island’s famous Gilded Age mansions. 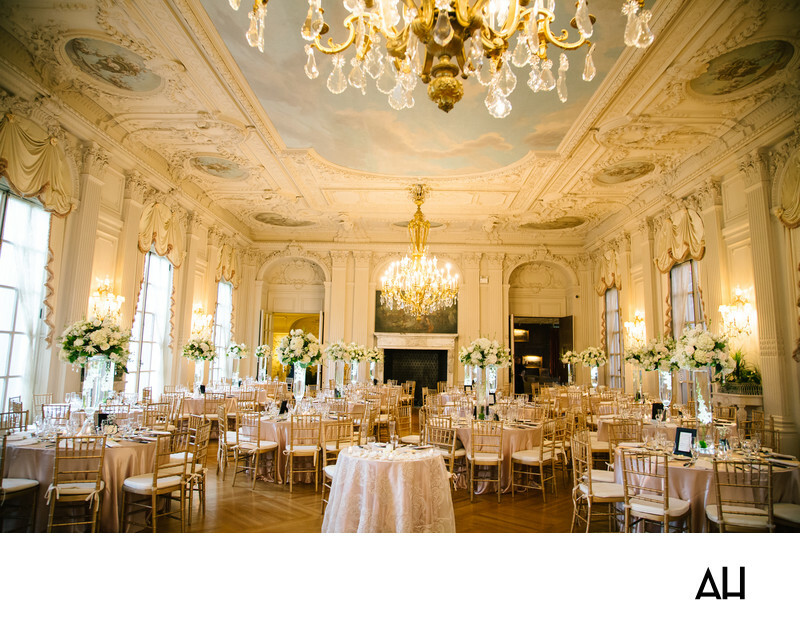 A Rosecliff Mansion Wedding is steeped in the elegance and grandeur of the mansion’s past. Construction of the grand house began at the end of the 1800s and took a few years to reach completion. The architect charged with creating the home modeled it after the Grand Trianon of Versailles, with arched windows and Ionic columns. The mansion contains a number of magnificent rooms, each lavishly decorated. The most notable room is the large, elegant ballroom. Wedding receptions held in this room give guests a sense that they have time traveled to one of the fabulous Newport parties of the Jazz Age. The ornate ceilings and walls of the interior, the beautiful murals, and the crystal chandeliers all add to the breath-taking splendor of the venue. A Rosecliff Mansion Wedding does not need much in terms of additional decoration. Couples typically choose neutral colors, such as the white flowers used as centerpieces and ivory linens in this picture, to complement the classic beauty of the room. The picture above shows the room in all of its glory, patiently waiting for guests to fill it. It is as if the room is holding its breath in preparation for the festivities that are about to occur.